Amber Glow of Awareness, Acrylic Painting on canvas. Blue Silence – 15×22 ink on paper original painting, unframed. Codex Del Sol, Original ink on paper hand made and bound book. Contact me for additional images from this book. Eagle’s Lodge – 15×22 ink on paper original unframed. 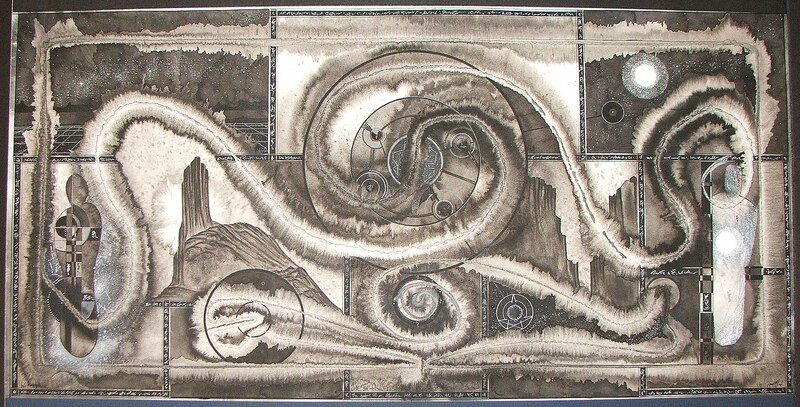 Emergence – 10×30 ink on paper original, framed. Enso Book, ink on hand made paper and hand bound. Contact me for additional images if interested. Five Bears – 22×30 ink on paper original, framed. Geographic Spirit – 10×22 ink on paper original unframed. Golden Mean – 11×15 ink on paper original, unframed. Holding the World, Mixed media, acrylic and encaustic on wood panel. Jerome Spirits – 12×22 ink on paper original. K Rising, Ink on paper original 15×22 mounted on board, framed. Mapping the Lodge – 22×30 ink on paper original, framed. Meditation Manual – Small hand made and hand bound book. Contact for more images if interested. Meditation – 11×15 ink on paper original, framed. Moon Dog – 12-21-11 – 22×22 ink on paper original, unframed. Non-Action Assemblage Point – 18×24 ink on paper original – framed. Perception – 8×22 ink on paper original, framed. Raven Winds – 10×20 ink on paper original, unframed. Raven’s Vision – 22×30 ink on paper original, framed. RavenWard – 24×48 acrylic and mixed media on canvas… more pictures available. Ride the Wave – 22×30 ink on paper original, framed. Secrets of the Bear Lodge – 11×30 ink on paper original, unframed. The Seed – 22×30 ink on paper original, unframed. Snake Spirit – Encaustic on Panel. Song of the Wind – 15×22 ink on paper original, unframed. Spirit Vision – 18×22 ink on paper original, unframed. Sunrise – 22×28 ink on paper original. The Bridge, 24×48 original ink on paper, framed. The Land is Sacred – 11×15 ink on paper original. The Nagual – 22×30 ink on paper, framed. Thru the Veil – 15×22 – ink on paper original painting. Thumb Butte, Ink on paper original, mounted on board, framed. Vortex – 11×15 ink on paper original, unframed. Wakataha – 11×30 ink on paper original. As many know, my work with the ideas of the toltec warrior are often expressed in paintings and images seen throughout this blog. Here is a comprehensive overview of many works created in the last three years. These works are in galleries and or in my collection and for sale. Yes even warriors of freedom must make money somehow. Many of these images are available in print form. If you are interested, please contact me to inquire about pricing, size, further pictures or prints of these works. 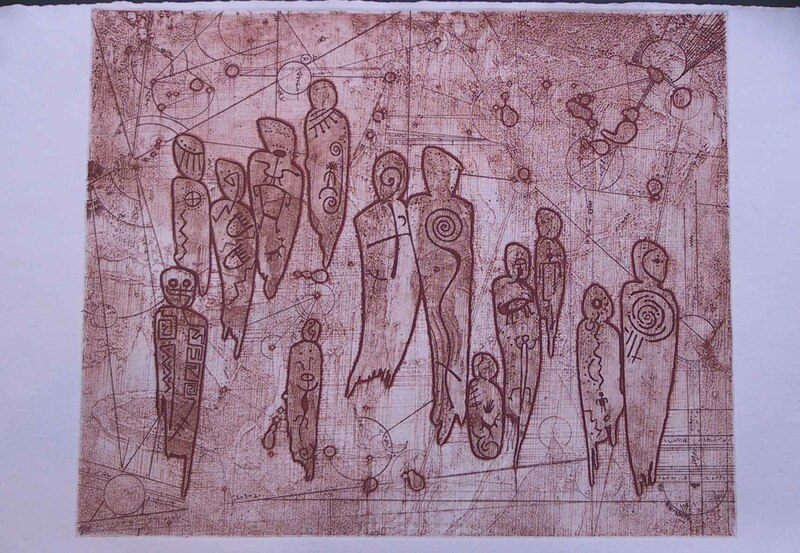 Since several are represented in galleries… they are out there for the world to see. Appreciate all the interest in the work, the words and the way of the warrior. Contact me at ravencircle1@gmail.com for further information. The warrior’s way is not something that comes naturally today with modern culture. Mother Culture downloads a program into its children that is filled with assumptions of unworthiness and submission to a system that “has always been”, but in reality it has not. It may feel like the only way to live, but the warrior learns that there is more.